Recently, I spent several delightful days with a client using CliftonStrengths 34 as a tool to guide a group of bright and talented leaders along a journey to develop greater self-awareness, a key component in authentic leadership. We are helping them take stock of their individual similarities and appreciate the value of their differences. Ultimately, this will embed in a common language they can use to intentionally leverage their strengths, bridge gaps, and deepen the leadership development practice in their firm. In case CliftonStrengths (formerly called Clifton StrengthsFinder and abbreviated here as CliftonStrengths) is new to you, each of the 34 talents ranked by the CliftonStrengths instrument has been cleverly sorted into one of four domains – executing, influencing, relationship building, and strategic thinking. After sitting one-on-one with a dozen leaders to unpack their assessment results last week, then debriefing with Jean about her parallel experiences with the other half of the group, and then preparing for an upcoming strategic retreat to kick off a new fiscal year for a different client, I’ve got strategic thinking on the brain! Three things about strategic thinking emerged, so I’m planning to make this part one of a series. The first one here is on how to combine two models of strategic thinking to better understand and explain how New Legends orchestrates strategic thinking with our clients. The second in the series delves into why strategic thinking is not a soloist act, but rather something that needs to be an ensemble activity. The third blog explores the idea of a “collective” strategic thinking mindset as a source of strength and source of blind spots in organizations. I’ll also zoom out on how strategic thinking connects with culture, leadership, and execution — the other three quadrants in New Legend’s circumplex. One of the first musings I had about the 8 strengths from CliftonStrengths that fall into the strategic thinking domain, was whether and how they fit into another strategic thinking framework, the LENS model. This is one I helped develop when I worked at UW’s Center for Leadership and Strategic Thinking (CLST) a few years ago. We created LENS because we couldn’t find a scientifically grounded framework or assessment for explaining and exploring what is happening inside people’s noggins when they are thinking strategically. We needed a framework for our work if we were going to intentionally and systematically help leaders improve their strategic thinking. Validation work on the LENS measurement tool is ongoing at UW, and I look forward to seeing it contribute to the science of leadership. 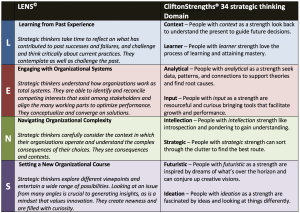 Though CliftonStrengths includes 8 strategic thinking strengths, this categorization was “after-the-fact” rather than a deliberate part of Clifton’s original design. In other words, CliftonStrengths wasn’t meant to be a complete, purpose-built strategic thinking model like the LENS. So, I was curious how much the two models overlap. It turns out I was able to map the eight strategic thinking strengths from the CliftonStrengths to the LENS framework reasonably well as you can see in the table. In my mind, this lends credence to both approaches to zeroing in on what we mean by strategic thinking. With a clear and shared understanding of “what it is,” we can not only encourage and develop it – we can measure it. CliftonStrengths ® is a Gallup product.© 2014 UW| Center for Leadership and strategic thinking | Avolio, Ruedy, Drummey, & Patterson. All Rights Reserved. Used with Permission. Using the LENS framework alongside the CliftonStrengths seems like a powerful way to help leaders and organizations be really specific about the thinking activities that need to be fostered to get strategic outcomes like innovation, competitive advantage, and sustainability. We need activities to help leaders with thinking that looks backward in reflection as well as with thinking that looks forward using the imagination. We also need to encourage and support present-oriented, systems thinking about current realities as well as contextual thinking about how to change the current reality. That means there are a number of different thought processes to encourage and manage! As consultants using these models, we can be even more intentional and confident about the tools we use to stimulate the full spectrum of strategic thinking when we are working with clients. Just as one example, the Current Reality Mindmap tool we use at New Legends activates the E and N areas of LENS and is likely to energize people with Analytical, Input, Intellection, and Strategic Themes near the top of their CliftonStrengths list. Whereas, we would use other tools and find people with other strengths for activities in the L and S ends of the spectrum. If we think about orchestrating strategic thinking organizationally, the LENS and these 8 strengths from CliftonStrengths become the conductor’s score!